Did you know that after about 1940 that the majority of MDT’s 14,000 car fleet was NOT white? Roger Hinman’s 2011 “Merchant’s Despatch” book (Signature Press) makes this abundantly clear. The NYCSHS answers this call with an HO model in two hues based on empirical photo evidence. The “yellow” models are appropriate for 1943 though about 1952 while the “yellow-orange” are intended for later eras. The lettering and boxcar red roof and ends found on the earlier models is “softened” to assist those desiring to weather their models. The 12,000 cars built to M4 specs represented 70% of MDT’s WWII fleet, tapering to 17% by 1955. Hence, heavy weathering is appropriate for the steam to diesel transition era. 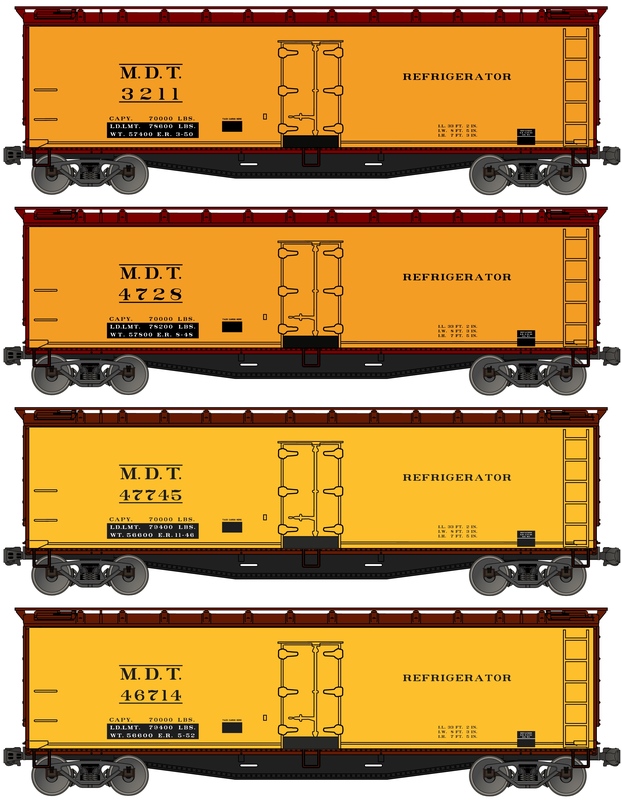 If you want pristine ones, then order the later version with the more vivid yellow-orange sides, darker lettering and boxcar red roof and ends. We have extra decals available to replace the printed car numbers on either set of cars so you can also add additional numbered cars to your fleet. They go over the printed ones and cover them completely. These unique reefers are coming in early March 2014 so you need to pre-order them now. The retail price is $25.00 each but only $20.00 each for NYCSHS members. Order a pair and NYCSHS members’ price is $39.00 for two or order four at $75.00 for members. Shipping is extra and Ohio residents must add 8% Ohio sales tax. These reefers are going very fast. We only have a few left. Don’t miss out on these exclusive NYCSHS models. Go to the NYCSHS online store and order yours today. They will be shipped in February 2014 and we are taking your reservations now. The easy way is to go to our store.